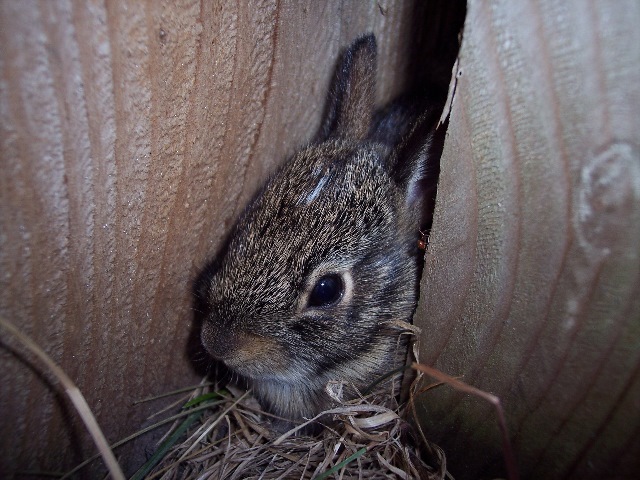 Many years ago, when I still lived in Illinois and owned a house in Aurora, Cricket found a nest of baby bunnies in the back yard. 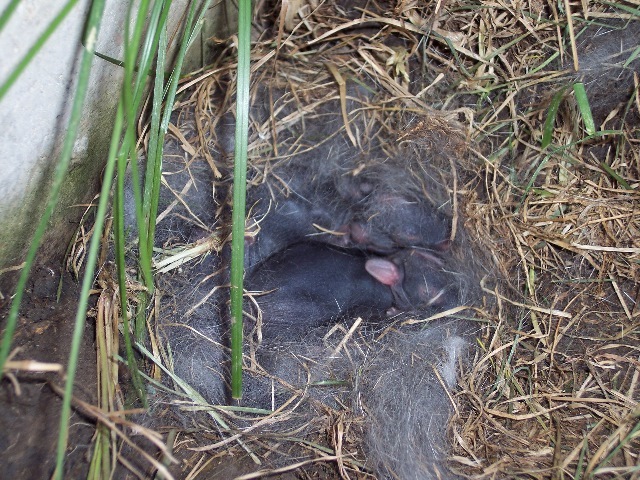 They were in a little hole, under a small picnic table. Cricket was much younger then (probably around 4 or 5 or so) and very much wanted to chase and eat the rabbits. Laura (my partner at the time) and I had to go to a bit of effort to supervise Cricket and keep her from tearing up the nest. Later, as they became more mobile, I remember her chasing one across the yard. The bunny made it across the yard and hid behind the fence post. It squeaked while it ran, which for some reason surprised me. Recently, I have been thinking about those baby rabbits. 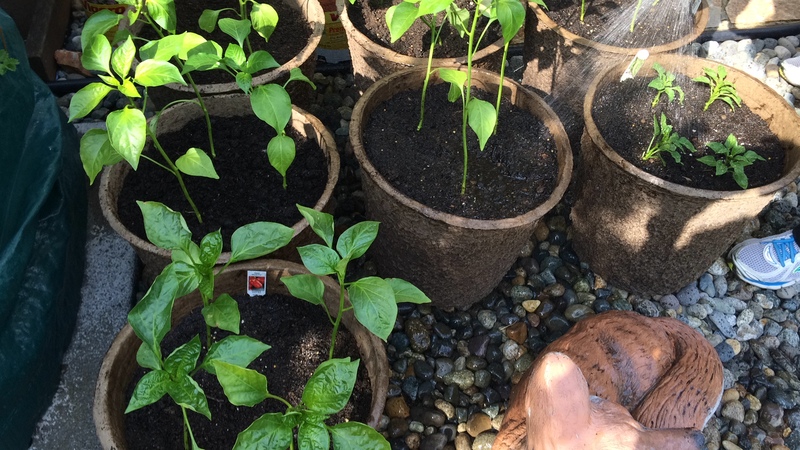 Back in May, we planted some pepper seedlings in several big pots (I’m a big fan of container gardening). 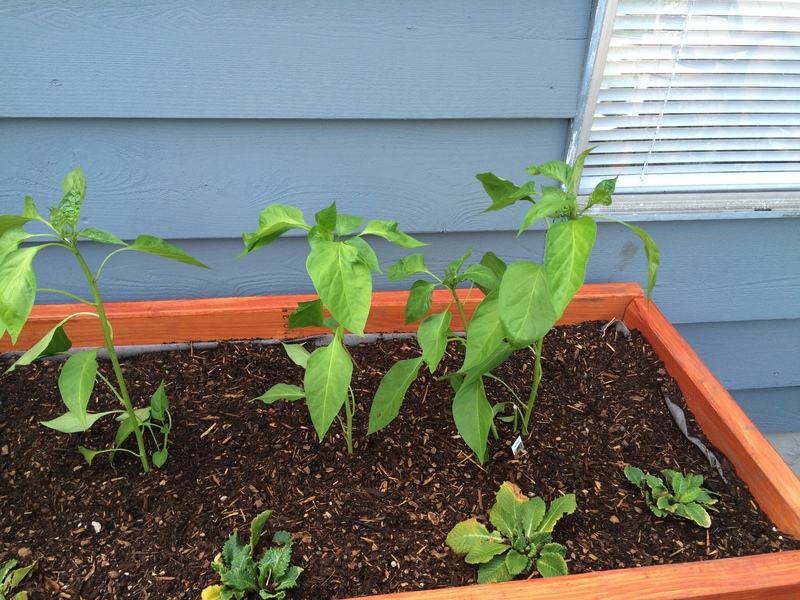 Anaheim, banana peppers, and one variety of bell peppers. The pots all congregated in a sunny corner by the deck stairs. A few days later, I was in the kitchen when Renee went down the deck steps and I heard her gasp. I followed her down the steps and discovered that some of the new plants were chopped down to just stems! All the leaves and most of the stem, completely gone! Pepper plants have been decimated! After some research, we decided that the pepper plant eating fiend was most likely a rabbit. Which made me think of those baby bunnies whose lives I saved back in 2005. You’d think I earned some good bunny karma. But apparently not. Anyway, we moved the pots up onto a table and out of reach of marauding rabbits. The untouched peppers continued to thrive, and, much to my surprise, the stubby stems of the eaten peppers began to grow back. 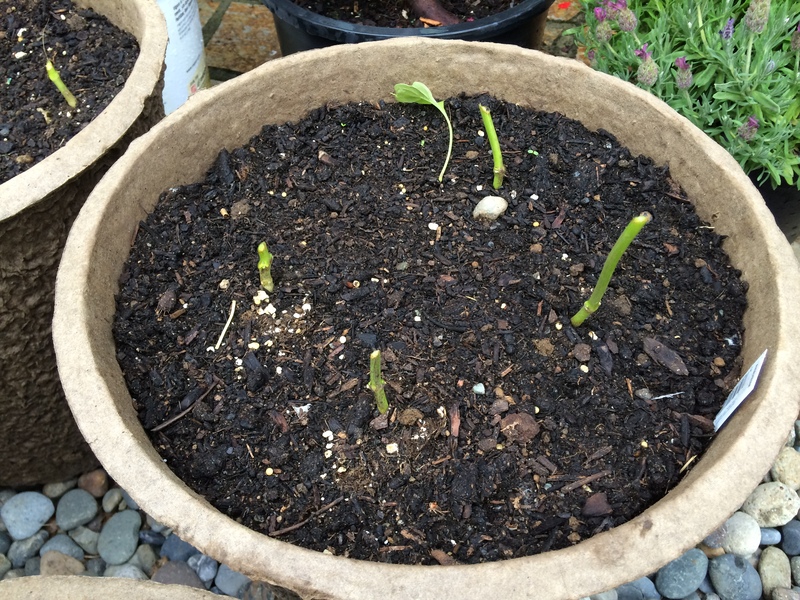 After a few weeks, they looked like seedlings again, full of new leaves. By today, they had tiny buds just waiting to open up. They are pretty far behind the plants that were spared (we already harvested a couple small anaheims), but hopefully the growing season is long enough that we might get a few peppers out of them. Today, Renee built a nice new garden bed, replacing some shaggy bushes that used to live along the garage. We used cool decorative brackets for the ends, and Renee stained the wood a nice red color. We had a minor glitch when the boards holding up the upper level bowed a bit; had to fix that with an emergency cross-brace. But otherwise it turned out great. We went ahead and transplanted the recovered plants. Hopefully, having more room to spread their roots will help them catch up! Supposedly bunnies are less interested in more mature pepper plants, but we will be keeping an eye on these…if the thieving rabbit returns, we’ll put up some sort of fencing around the new bed. 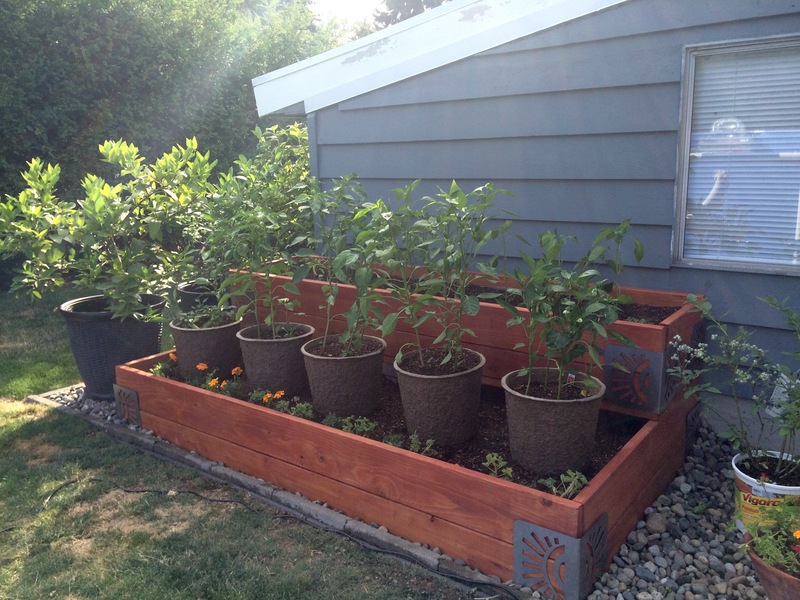 I love our new planting bed – and I love the fact that this garden story may have a happy ending after all.